That menu option is called "Preferences" instead of "Properties", since it is a more common label in GUI applications, and a standard in Mac OS X. By clicking on the preferences icon in the Welcome view. By pressing the menu option Edit -> Preferences. By pressing Alt+Enter at any moment. We talk here about user preferences, meaning those preferences affecting the session that the user may want to change in a user friendly way. Therefore we don't consider system preferences, which are used by developers for introducing some flexibility in the functionality they provide, but users shouldn't be concerned of. The existing properties mechanism may still suffice for them. Nevertheless, preferences can reuse properties and even be just a wrapper for them if needed, as explained later. This way, the break is not dramatic, although replacing properties by preferences is encouraged. Preferences are organized in categories, which have a hierarchical structure. Each category may have a parent category (at most one). A category with no parent is called a root category. It is like a tree, where more than one root is allowed. Every category is identified by a string that contains its whole path, including its ancestors. This full path must be unique. Preferences lie under a particular category. They are identified by a name called key, which must be unique within that category, but can be reused in other categories. The explained approach leads to a preferences dialog in which the user may navigate between categories, select one of them, see and change any of its associated preferences, and accept or cancel the changes. Adding and using preferences has few simple steps. From one side, if you want to introduce a new category, you need to write a preferences panel, and then register it. Afterwards, client code would want to read those preferences, which is done through the UserPreferences class. Probably it would also want to listen to modifications, so the user doesn't need to restart HIPE for his changes being applied. Optionally, you may want to link a preference to an existing property that you just want to migrate to the preferences framework. A step by step approach is described in the following subsections. When the user clicks on a category within the tree, the corresponding panel is shown at the right side of the dialog. In this method you call registerHandler once per preference. This is how you specify the keys belonging to the associated category. Each preference is handled by a PreferenceHandler, which provides the means of updating the GUI with the existing preference value and to get any change that the user introduces, and more. You may consider to extend AbstractPreferenceHandler or use one of its basic extensions, instead of implementing the interface directly. Here you create and add to the panel the graphical components for showing and changing the preferences associated to this category. // Preference keyA with type String and default value "text"
If you have developed the preferences panel, you have done the hard work. Registering the category and its associated panel is straightforward. As usual, it is done in the Extension Registry within a __init__.py file. The framework creates here an empty panel for you, with a message saying that preferences can be found in children categories. The next step is to use the preferences in client code. This is very easy and just implies using UserPreferences where you would use Configuration. Preferences are supposed to be changed only by users, within the preferences dialog. This is the reason why UserPreferences just provides methods for reading preferences, but not for changing them. Now, it may be the case that you need to update preferences from some user action. For instance, user presses Ctrl-+, so all font sizes must be increased. This communication can be performed through events: the requester code triggers an event, which is listened and handled by the corresponding preferences panel. We have an editor with a split panel, and want to detect any drag in the split separator by the user, so its new position is saved as a preference. 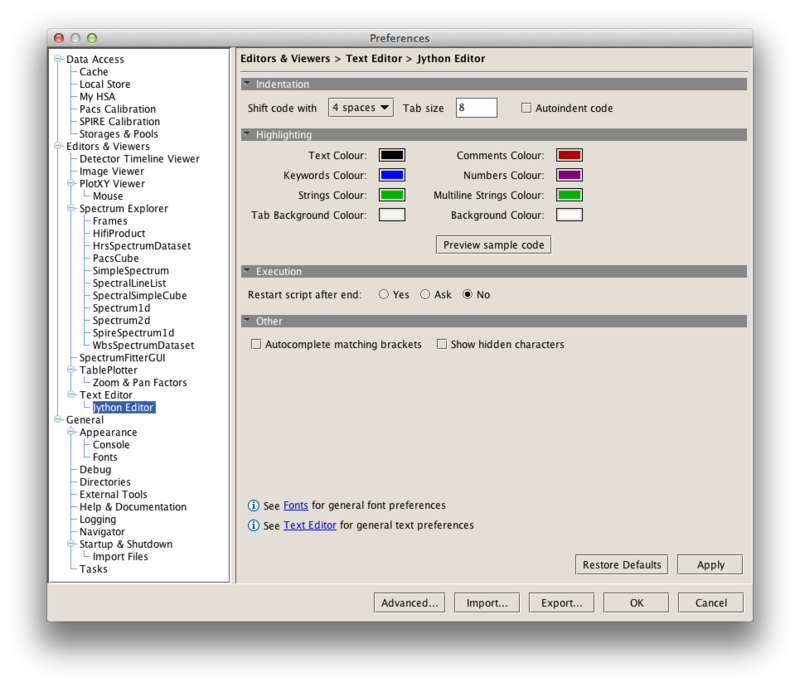 Suppose the user opens an editor component you have developed, then opens the preferences dialog, changes some preference related to the presentation of your editor, and presses OK. The user would expect that these changes would be applied to the opened editor, not only to editors opened from that moment on. To solve this situation, your editor should listen to preference changes by implementing PreferenceListener and registering with UserPreferences.addListener. Now, what happens with plain old properties? If you create new preferences that have no correspondence to existing properties, all we have seen till now should be enough for you; you don't need to worry about properties. The more common situation may be that you want to migrate some existing property to the new preferences mechanism. This means that the preference should take the value of the associated property while the user doesn't override it. After being overridden, the saved preference is used and the property will not be taken into account. Although the previous two approaches are recommended, it may be the case that you cannot use UserPreferences in your client code, for example because your module cannot depend on ia_gui_kernel, but still want to provide a panel for the user in the preferences window. For instance, you want to add a panel for letting the user to set the Versant server and a database name. In this case, your panel should be written in a module that can depend on ia_gui_kernel; however, herschel.versant.store (in this example) can only use Configuration for reading the preferences values. The solution is to provide the PreferenceHandler the name of the associated property, so the framework would override the property in hipe.props. In this case, the property would also be used as default value, if existing. As seen above, you can specify the type you want for each preference. The PreferenceHandler enforces you to provide the correct types when writing their implementations. The valid types for preferences depend on whether their associated handler uses a property (PreferenceHandler.getProperty() returns not null) or not, that is, if you provide a property when constructing AbstractPreferenceHandler or not (see examples above). If you don't provide a property to the handler, the valid types are Boolean, Integer, Long, Float, Double, String and byte. If you provide a property to the handler, the valid types are reduced to Boolean, Integer, Double and String. The reason is that Configuration provides methods for getting the property as boolean, int, double or String, but doesn't provide methods for the other types.